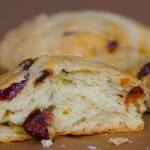 Holiday Cranberry Scones- No Flour! With the holidays here I thought it would be fun to make Cranberry Scones with a sweet spread for Thanksgiving dinner last week. I have to admit I do like traditional foods around the holidays, so learning how to enjoy the flavors and foods is where I have to get creative. What I love about these scones is that there is no wheat or grain flour! What’s so cool about that? That means they are low glycemic which means the scones don’t spike your blood sugar and cause you to store excess fat on your belly or thighs or where ever it goes on your body. I made two videos. The first one shows how the make the cranberry scones and the second one shows how to make the spread, my favorite. The first step is to buy or make almond meal as the base for this recipe. Although you can buy it, it’s easy and fun to make it yourself. All you’ll need is raw almonds, water, a nut milk bag which you’ll see on the video and a powerful blender like a Total Blender or Vitamix. Only use about 2 cups of almonds at a time in the blender and fill the rest of the blender with water. You’ll need to do two batches in the blender. 1. Blend until almonds are as fine as you can make them. 2. Use a fine mesh nut milk bag (or a paint bag from Home Depot) to strain the almond meal from the almond milk. Pour the liquid into mesh bag and squeeze almond milk into jar or bowl. Make sure to squeeze all the liquid out through the strainer so you’re left with what will be a dry and crumbly almond meal. Place the almond meal in a bowl. *** Don’t throw the almond milk away! You can always use the almond milk to make other things and it will stay good for up to a week in your refrigerator. You can use the almond milk in smoothies or in a chocolate drink, it’s a great snack, or on cereal, or for breakfast foods even some soups! 1. Place your raw almond meal in a large mixing bowl and combine with ground flaxseed, coconut oil, cranberries, orange zest, dates cinnamon and salt and mix together with your hands. 2. Once all the elements are mixed well, cut the mixture in half and form 2, 1 inch thick tubular logs. 4. Cut the scone loaf into triangular shapes, place on dehydrator tray or baking sheet and place in dehydrator or oven on low for up to 2 hours. 5. Dehydrator takes longer. Mine dried in about 12 hours. This recipe will yield between 16-18 scones. Enjoy! Mix by hand in a small bowl with a fork. Store at room temperature in a glass container. Now it’s ready to spread on the Scones! I would love to hear recipes you make that are a healthy twist on highly processed traditional foods. How do you change up traditional favorites to make them healthy? Hi Kardena … the scones look wonderful! I can’t wait to try them. I bought some almond meal … how much should I use in the recipe? You need 4 1/2 cups almond meal. Enjoy! I am unable to purchase coconut oil where I live. What else can I use? & I’m allergic to coconut!! I am anxiously awaiting for an answer to this question, Kardena!?! A great place to get unrefined, virgin coconut oil is from CoconutOil-Online.com. Their’s tastes great! they have great service and their prices are reasonable, with a flat shipping rate no matter how much you order, and it comes really quickly. Hope this helps. Great info Patricia, thanks for passing it on! 1. If buying the almond meal (not making from scratch), how much should you use? 2. What temperature would be ideal for baking in the oven? You want to use 4 1/2 cups of almond meal. for the oven I would put it on the lowest setting. honestly I use the dehydrator so you may have to experiment. I’m not sure on this one, but one would be a serving size. I have the same questions as Wilhelmina. How much almond meal should you use if you are buying it and what is oven temp do you use for the scones? Also, if you are making the almond meal from scratch do you soak the almonds first. If so, for how long? Thank you. you use 4 1/2 cups almond meal. You’re going to use about 5 cups whole almonds if you are making it from scratch. Keep the oven temperature pretty low like in the high 100′s (farenheit). Soaking the almonds is not a must but it will help with the blending process. If you choose to soak them, soak for 12-24 hours. With regards to the coconut oil – is it one cup in liquid form or solid form? I too would like to know what you would suggest as an alternative. I like Earth Balance sticks for baking. Would you still need a cups worth of Earth Balance? I love the fact that you are offering wheat-free recipes as I’ve recently had to eliminate wheat from my diet. With coconut oil, I measured it 1 cup solid form. You can use Earth Balance as an alternative, that would be just fine. You would use the same amount, yes. I’m happy to hear this works for you! enjoy! How many raw almonds do you start with? I don’t see that information listed above. And as Linda asked – do you soak them first? I’d still like to know about coconut oil substitution. Start with about 5 cups whole almonds, then measure out 4 1/2 cups almond meal after blending. I will add that to the recipe above, thank you for catching that! I cooked them in the oven at 200 degrees for 1h 40m, then I turned off the oven and let them sit for 30 minutes more. They had a perfect texture, and taste fabulous. These would be great for energy bars, on the go meal replacements or just a delicious snack when you want something a little sweet. Thanks Kardena for the great recipe – I’ll be sharing it with my friends! When you can satisfy your husband AND it’s healthy, that’s a winner! Wow, that sounds great, and I appreciate that it’s flourless! Not to mention getting almond milk and scones out of one batch of almonds. Brilliant! I ran across this recipe on YouTube and had to check out your website! I love this recipe! 1st, I would seal them in a ziplock bag to store them longer. I don’t have an exact amount of time but because they are dried, there’s nothing to really go bad. If it was me, I’d probably store for 30 days. Kardena's Kitchen » Big news in our home! Someone’s pregnant!